There were rainbows shining brightly today all over Seattle as the Pride Parade attracted 500,000+ spectators celebrating a really totally damn good week for all citizens in the U.S. Well, unless you still fly the Confederate flag. Just take it down already-you lost. BOOM! 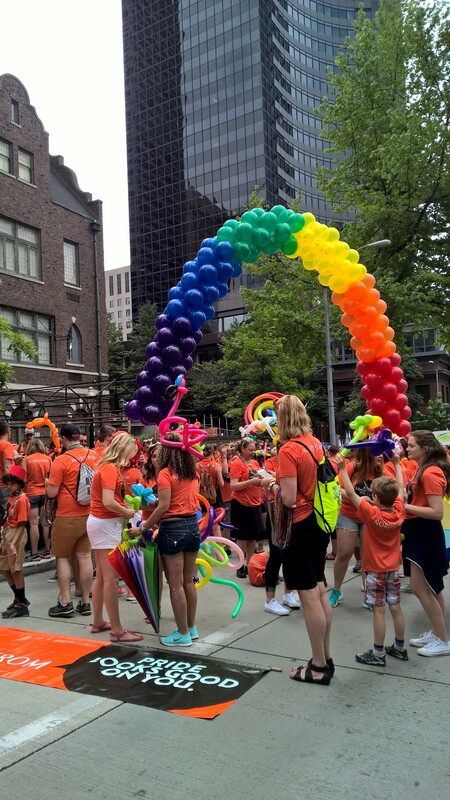 I love a rainbow balloon arch-kudos to Nordstrom’s who had a huge contingent in the parade! 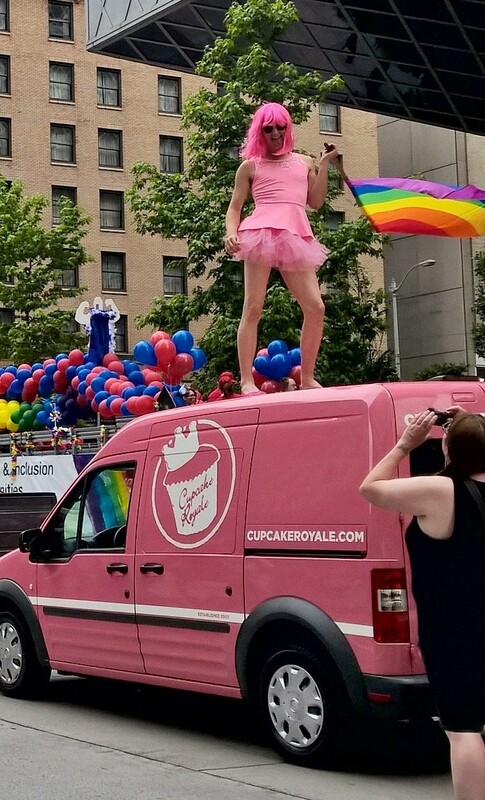 Dancing on the Cupcake Van to celebrate! But today, it was all about celebrating diversity and equality with the crowds of all ages waving their flags with spirit and pride. Way to go Supreme Court! Your history-making decision affirmed everyone’s right to be married in every state. WOW. About time and just in time for the celebration today. To say that smiles were on everyone’s face would be an understatement–there was dancing in the streets, on the cars, in the bars, and one naked guy entertaining the crowd with his bagpipes. Crazy and fun to be sure! 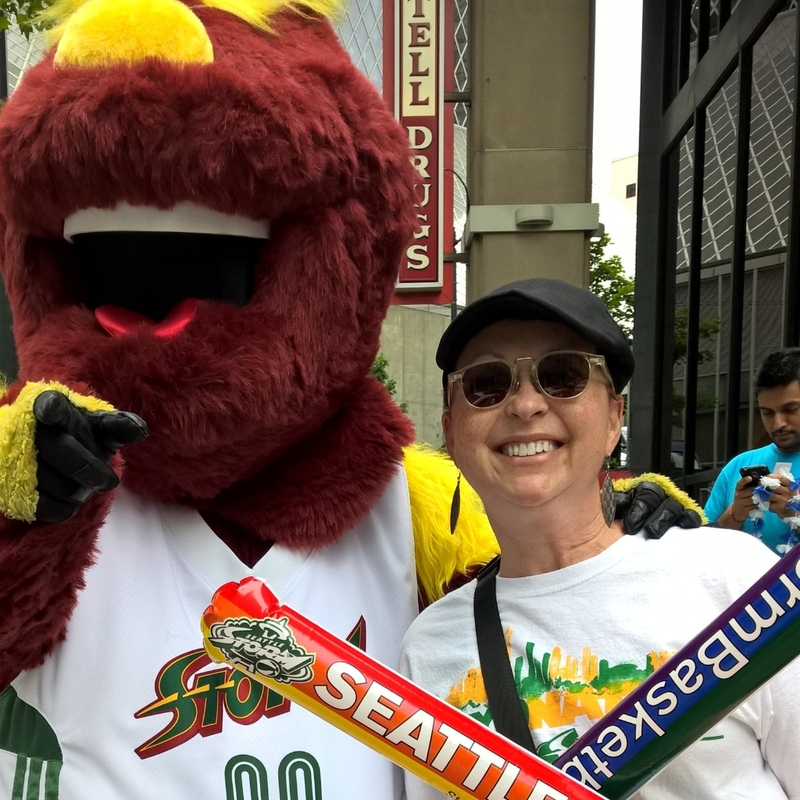 Thom and I love the Seattle Storm, our WNBA team here that plays next door to us at Key Arena so we joined their contingent to spread the Storm love to the parade goers. The local women’s soccer team, Seattle Reign FC, also joined our group as we passed out boom sticks to the cheering crowd. 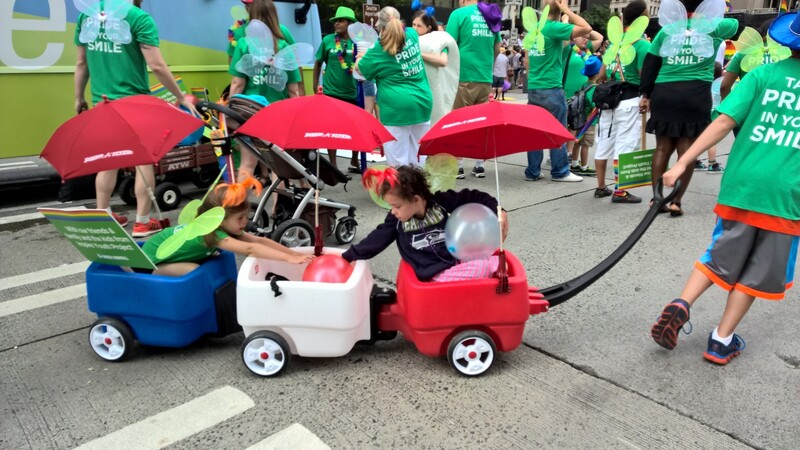 As we neared Belltown and the boom supplies dwindled due to Thom making sure every child along the parade route got one, the water guns came out and the team mascot, Doppler, started drenching the delighted crowd on a thankfully cloudy day. “Spray me, spray me!” the crowd yelled and Doppler was glad to oblige. Doppler and I shared a moment with our boom sticks! The SeaFair Pirates were working the crowd as well as some amazing dancers wearing headpieces bigger than me. How on earth they were able to walk even a block is beyond me. I was impressed! Whether gliding along on rollerblades or walking the route in stiletto’s, the parade moved along briskly and I got in my 10,000 steps on my FitBit before it ended by the Seattle Center. Our church, First Church Seattle, was handing out cookies at the end of the route to all who had walked and provided communion as well-what’s not to love about a church like this! There was even a rock band cranking up the crowd. Elaborate headpieces and shoes were the standard uniform. Every major company in Seattle embraced the Pride and had huge company representation: Nordstrom’s, Boeing, Microsoft, Expedia, Amazon, etc. In front of our Storm crowd, the Café Vita, a local coffee roaster was throwing coffee into the crowd…how Seattle of them. Fresh roasted beans for all! What impressed me the most was the inclusion of all the families in the celebration. How wonderful that these kids will grow up knowing it’s okay to love and marry whomever you want. It’s all good. What a happy day! Families and LOTS of kids enjoyed the diversity in the parade.